Season’s over. Time to compare my Championship predictions with what actually happened in the real world. At the beginning of the season I listed out the Championship teams in a rough order of where I expected them to finish the season. Nailing at definite order proved too tricky, but I at least grouped the teams into a groups of four. The order was based on my judgement of each club’s respective squads and the perceived wealth of the at club, which, I reasoned, might translate into some kind of buying power in the transfer windows. Wigan actually win the under-achiever prize by quite a margin. Looking at their squad there’s no way they should have been relegated. They finished the season with James Perch, Marc-Antoine Fortune, Jermaine Pennant, Emerson Boyce, Scott Carson & James McClean in their team. On paper, they have a team that should be sniffing around for a play-off space. I was still of the belief that they had enough to scrape clear of relegation right up upto the point that their racist manager, Malky Mackay, was sacked. I guess the volume of change at the club this season was just too much to absorb. Brentford confounded expectations throughout the season. Whilever I was convinced that Fulham and Wigan would rise up the table after bad starts, so I was of the conviction that Brentford would fall away. Seeing them dismantle my team Huddersfield Town at Griffin Park was a humbling experience. Jota, Pritchard, Toumani Diagouraga and Andre Gray have all had impressive seasons. So fans of Millwall & Blackpool don’t despair! You were only as poor as I expected you to be. That’s probably not much comfort I suppose. League 1 is actually quite a lot of fun though, so enjoy it. Not sure what conclusions I can draw from this exercise particularly. It seems I was more successful picking the losers than picking the winners! I completed my first marathon yesterday. In the run-up to the day I’d been 50% terrified and 50% excited. As the day loomed closer the terrified half of me over-powered the excited half and completely took over. In the end though, the 3 months of training and a measured weekend of preparation stood me in good stead. Once the fatigue and emotion faded from the run I couldn’t have been more delighted with my time. Walking from Bletchley Station to Stadium MK I’d briefly chatted to another runner who had run the course the year before. I asked him what is was like. “It’s a bit boring actually,” he admitted, “but it’s flat and wide, so you’ll have plenty of room, you’re able to go your own speed.” So it turned out to be. 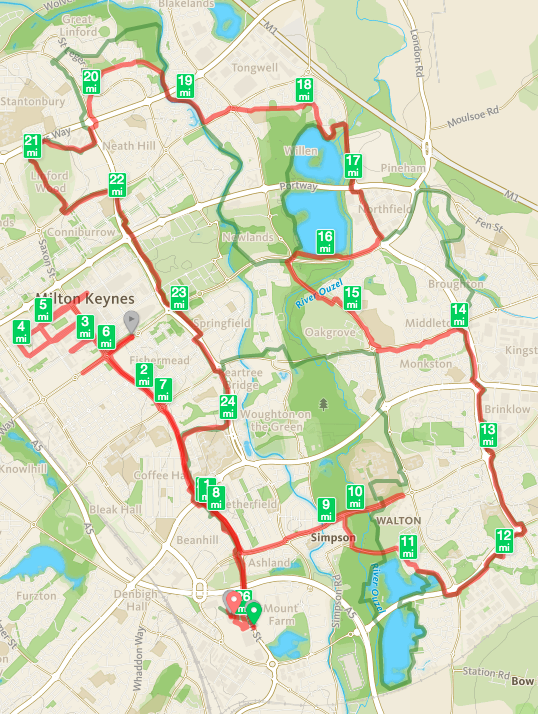 The first half of the course conforms to the cliché of Milton Keynes as a typical new town. It’s dual carriageways and roundabouts punctuated with U-turns. The second half of the course was on “Redways” which turned out to be pavements next to dual carriageways. Sometimes there’s a hedge between the pavement and the A-road, sometimes not. Occasionally the path dips into housing estate or parkland and it becomes more of a cycle path than a pavement, but you get the idea. Starting and finishing at Stadium MK though, was lovely. It’s rare to have so many toilets at a marathon start and not to have to queue for 45 minutes for a stinking portaloo. The last 500 yards – downhill into the stadium and then around three sides of the pitch was a fitting finale, even if the stadium was sparsely populated. Worried about being late, I’d arrived way too early. I took in the stadium (which has been finished since the last time I’d been watch a football match there) and then wandered down to the arena to prepare – a slow hydration and warm-up in a cavernous shed to the sounds of Alanis Morrisette over a tinny PA. The start line was only a five minute amble away where I whiled away another 45 minutes listening to Faithess and Katrina & The Waves over a better quality PA. Having learned from the North London Marathon a month or so earlier, I was clad in a black bin liner to stop from getting cold, the weather was bright but with a cold breeze and I was glad of it. The wind turned out to be a huge help when the race started, a tailwind for the first 4 miles, and then a lovely cooling factor for the next 4. As per my (very rough) plan, I held myself back for the first 3 miles and then settled into my natural 8:40min/mile rhythm. A quick stop around 6 miles for sock maintenance was the only glitch. The miles ticked off and I was pleased to get to the halfway point in 1:55:57. I remembered the story that my colleague Harry McGarry told me of his London Marathon when, after reaching halfway in 2 hours, his day fell apart. “The race starts here,” I told myself. The plan was to maintain my natural pace, but I subconsciously upped my work rate with my two fastest miles coming in mile 14 and mile 16. Around this stage of the race you start to see people wilting and, eventually, slowing to a walk, but I felt good, I was into my rhythm, I found my mind wandering and it no longer felt like running anymore – it just felt like keeping on. The wind, which had been such a friend early in the race, had disappeared by now. The sunshine had won the weather war. I started to get a dehydration headache right on the top of my head. Later water stops consisted of cups of water rather than bottles or bottles with large screw tops instead of flip caps. I was throwing more water in my face than was going in my mouth. I’d debated with myself when to award myself another gel and settled on the 19 mile marker. Then I delayed it to the 20. Then I decided against the complicated manoeuvre altogether in favour of just concentrating on maintaining a running action. When the route turned a corner to reveal just a gentle incline I took it as a personal slight, like perhaps the organisers had planned this specially just to torture my calf muscles, to break me and to make me give in and slow to a walk before the finish. I felt another wave of relief at 24 miles but, of the final 6 miles, each successive mile felt more painful, and further, than the last. The final 2 miles my pace dropped below 9 mins/mile for the first time. When the stadium revealed itself from behind a clump of trees it could not have been more welcome. Annoyingly, the course took us past the stadium and around a car park before we could finally enter the damn thing. I managed to speed up for the run down into the stadium and then managed another burst of pace in the final straight. Crossing the finish line I was struggling to feel any specific emotion. I was relieved I suppose, but there were may other strong feelings that my brain couldn’t process and it was all I could do to stop myself from collapsing and sobbing. There were other runners laid in a crumpled heap on the pitch and joining them didn’t seem like a terrible idea, but I staggered on to get myself a bottle of water and a banana. I completely missed the medal handout and a small boy had to run after me to hand me my trinket. Emma had just arrived at the stadium 5 minutes before me. It was lovely to see her and get a hug and to know that she’d been able to see me cross the line but I didn’t have a single intelligible thing to say to her. I was overwhelmed, my brain was frazzled. I hadn’t expected the whole thing to be such an emotional experience, and even now, 24 hours later I’m not sure what those emotions were. Looking back on my half marathon experiences, it feels like a half-marathon is actually a pleasurable experience – a sensible and enjoyable distance to run. The full 26.2 miles though, for me, I’m not so sure. From here I’ll focus on improving my 5km and 10km PBs – I think I’ve actually beaten my best 10km time at some point in and amongst my last half, and was probably only a minute or two outside it in this marathon. If I can get a sub-50 minute 10km time and may sub 21 minutes for 5km this year I’ll be happy. I’ve once more entered the ballot for the London Marathon in 2016, but I’ll tackle that if it happens. If the email comes in October telling me I’ve got a place, memories of the blisters I’m currently nursing and that mental and physical struggle in the final 2 miles along Saxon Street will have long since faded.